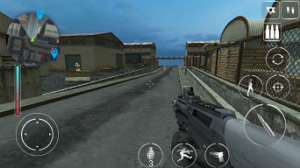 Call Of Modern Warfare: Secret Agent FPS is a new action-shooter game for Android in which you complete missions. It features dozens of challenging levels. The player can set the difficulty level[Easy, Medium, and Hard] from the settings. In this game, you play as a commander and the goal is to complete missions. You will get information about the mission that you have to complete at the starting of the chapter. The first chapter is a tutorial in which you learn about the controls; jump, shoot, reload, weapon change, zoom in, sensitivity, grenade, and more. 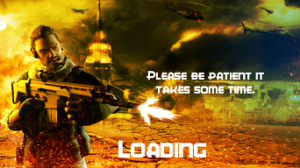 It’s a single player offline shooting game and features dozens of chapters, many types of weapons such as the grenade, pistols, rifles, rocket launchers, and much more. There is a map at the top left where you can see your enemies’ location and target area. The redpoint highlights enemy location whereas the blue point is your target area. Follow the blue point on the map. Kill enemies, pick their weapons and ammunition to increase health. Don’t play the game blindly. Shoot your enemies silently like a pro. Some of the weapons are locked. Complete the chapters to unlock more powerful guns and shoot down the terrorist leader. It has good graphics and gameplay. Multiplayer mode is not there. You can play this FPS game offline. Price – Free[Contains ads, In-app purchase]. Size – Under 100MB. 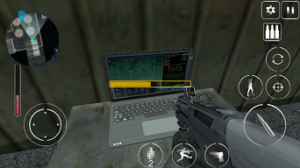 Download Call Of Modern Warfare: Secret Agent FPS – here[Google Play Store].